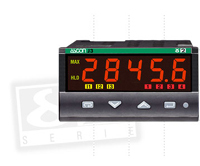 High quality solutions for your digital panel meter requirements. A wider range of models, sizes, and capabilities from our basic CUB indicators to the versatile PAX process meters that let you add or change capabilities with plug-and-play, field installable cards. Indicator-transmitter, 5-digit with two addressable alarms. Can be used as an indicator or controller. Universal input for thermocouple, PT100, mV, mA, V.. Optional RS485 comms, analogue output. 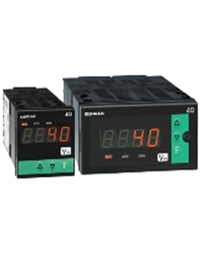 Double input indicator/transmitter with 4 addressable alarms. Universal input for temperature sensors, mA, mV, Volt, IR, custom inputs. High level second input 0/4-20mA, 0/1-5, 0-10 V. 3 digital inputs, 3 set point relays. 0/4-20mA retransmission output. 4 addressable alarms with delay, latching and blocking functions. Display of min and max values. Hold and temporized hold on display peaks. 5 digit, 2 colour display with different combinations. RS485 serial communications. Transmitter power supply and IP65 front panel protection. These displays are so-called “Value for money” products due to their high quality and very competitive prices. 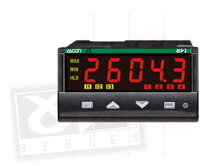 In addition, the displays manage to meet almost every demand for display reading of process signals. The displays have universal input and supply capabilities and are thus unique compared to other displays at this price level. This distinctive also makes the 57xx-series an interesting module for private labels. Finally, the 57xx-modules are front programmable and have a tightness of IP65. In addition to this, the 5715 can be programmed via pc to perform advanced functions such as process calibration and linearisation. Fast microprocessor display/alarm unit 96 x 48 (1/8th DIN) format. The front panel has a 6-key soft-touch keyboard and 5-digit LED display of process variable and parameters. The instrument is appropriate for acquisition of signals with high variation speed. 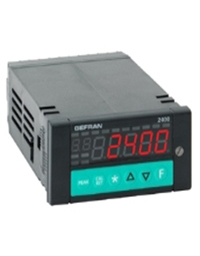 It has two main analog inputs for many applications, including differential measurements. The inputs are configurable from the keyboard and accept standard linear signals (and custom linearized signals), as well as signals from pressure probes, load cells, potentiometers, TC, RTD. There are two additional analog inputs for linear signals and two digital inputs for functions such as alarm latch reset, peak latch reset, calibration check, hold, alarm setpoint selection. The outputs (up to 4) are relay or logic, and are configurable. The instrument manages functions such as storage of maximum peak, minimum peak, peak-peak values. Indicator-transmitter, 5-digit with two addressable alarms. Dual colour display (changes on alarm). 16 segment linearization. Universal input for thermocouple, PT100, mV, mA, V.. Optional RS485 comms, analogue output.